SARAH LIVINGSTON JAY and MARY WHITE MORRIS continued to correspond. See previous post. By this time Sarah was in Paris where her husband John served as a peace commissioner. Her subjects were children—two of the Morris sons had been sent to Europe to continue their education. And clothes—after all this is Paris. And then there are the Marquise de Lafayette and Marie Antoinette. Making for an interesting letter, don’t you think? Paris 14th Novbr. 1782With what pleasure my dr madam do I take up my pen as a medium of or substitute for a conversation with you by admitting no other idea to rob me of your image; I enjoy, at least for the moment the most pleasing delusion—Yesterday your little sons by passing their holiday with me made me very happy—Robert so exceedingly resembles Mr. Morris that I feel for him a respect mingled with my love; tho’ at the same time I regret his distance from his father’s example & counsel—When (as it sometimes happens) among our Little Americans that my decision is referr’d to respecting matters of right & wrong, I always request Robert’s opinion; & when he hesitates, I ask him what he thinks would be his Father’s sentiments upon such occasions, to which he generally replys very justly; & I remark to him the certainty of his acting with propriety while he imitates so worthy an example—Tommy (who is likewise a fine boy) told me that his last letters mention’d [his sisters] Hetty’s & Maria’s illness—I hope they are now quite recovered as well as my dr. Kitty [Sarah’s sister Catharine]—will you embrace them for me? The Queen has lately return’d to Versailles after a residence of 8 or 10 weeks at Passey – While there I used some times to have the pleasure of seeing her at the Plays—She is so handsome & her manners are so engaging, that almost forgetful of republican principles, I was even ready while in her presence to declare her born to be a Queen.— There are however many traits in her character worthy of imitation even by republicans, & I cannot but admire her resolution to superintend the education of Madame Royale her daughter, to whom she has alotted chambers adjoining her own, & persists in refusing to name a Governante for her. . . . The letter appears in Selected Letters of John Jay and Sarah Livingston Jay, compiled and edited by Landa M. Freeman, Louise V. North and Janet M. Wedge, (Jefferson, N.C.: Mcfarland & Co, 2005), page 123. 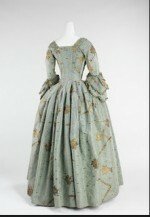 The Illustration of the robe à l’Anglaise can be found HERE. 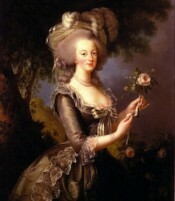 The Marie Antoinette portrait is by Louise Élisabeth Vigée Le Brun, 1783 taken from Wikepedia.